Alan Reid was born on the 19th of April 1966. From an early age he showed considerable running talent – especially speed – and was a ferocious front-runner, although he was, just occasionally, known to ‘blow-up’. It took a few years to develop tactical awareness, and then, for more than two decades, Alan was usually the best cross-country runner in the North of Scotland and also ran for his country. He was also successful on the road and eventually represented Scotland and Great Britain as an ultra-distance runner, in International 100k races, including the World Championships. His bravery is unquestioned, because of his boldness in races and frequent battling through injury. In addition he is friendly, cheerful and eccentric! As a Youth, he ran cross-country for Coasters AC, which was based in Banff. Donald Ritchie, the great ultra runner, remembers him asking for advice about whether to wear spikes or studs on the notoriously hilly and stony Lochaber AC course. Studs were recommended, of course. Alan won the 1985-6 under-20 title in the North District Cross Country League. This must be one of the toughest, traditional CC leagues in Britain. Even nowadays, the courses feature tussocky grass, deep mud, snow, ruts, tree-roots and hills and frequently traverse burns and even icy rivers. Weather conditions are often wintry and, as they say, seriously challenging. It’s not compulsory to be mad when you tackle these events…… At least six races take place each season, in venues including Keith, Elgin, Forres, Nairn, Inverness, Caithness and East Sutherland, and the points accumulated in an athlete’s best four races count towards the championship. (In the earlier part of Alan’s career, you had to complete five of the six races.) Over the years, Alan Reid won a great number of races, usually by large margins, and finished second or third in most of the others. He won the senior title for the first time in 1988. His last triumph was in 2011. Altogether, representing Coasters or Peterhead Running Club, Alan accumulated an amazing total of thirteen North League championships. In addition he won the North District CC championships five times; and won the Aberdeen Hydrasun CC ten times. 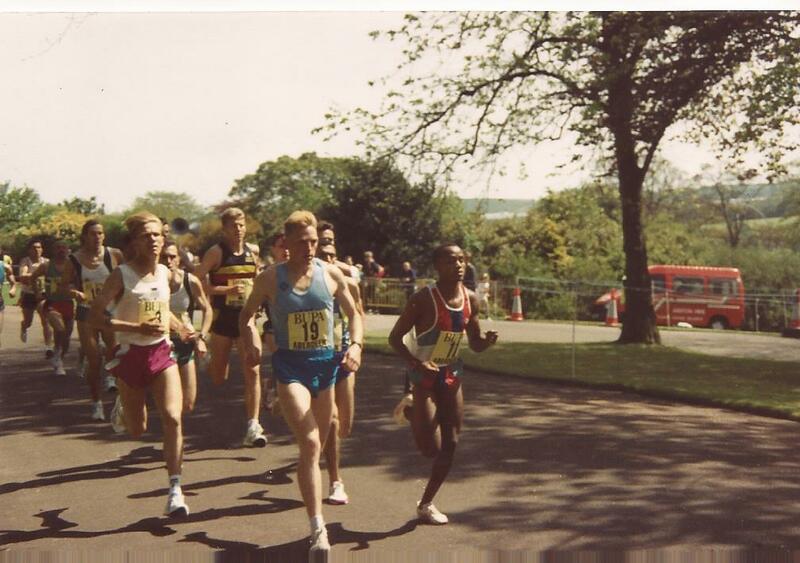 In addition he ran well in the Scottish National CC, with a best placing of 16th in 1994 as well as 22nd and 23rd. Alan Reid ran internationally for Scotland on several occasions, starting as a Junior in the 1985 Inter-Area contest at St Andrews. As a Senior he represented his country twice at Mallusk, Northern Ireland, and also in Durham and at the UK World Championship trials at Bellahouston Park, Glasgow. In 1989, running for North District, he won the Inter-District CC, beating amongst others the illustrious Tommy Murray. 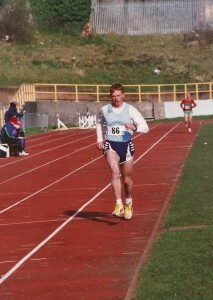 In the Edinburgh to Glasgow Road Relay, Alan represented North District eight times in succession, between 1987 and 1994. Although the team was never better than tenth, he had particularly good runs on the two most prestigious stages: Six (in 1989) and especially Two – he gained five places in 1992, 1994 and 1993, when he was third-fastest to Alan Puckrin and Bobby Quinn, in front of luminaries like John Sherban, Graeme Croll and Peter McColgan. 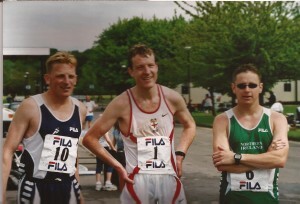 Then in 2001, on Stage Two yet again, Alan ran for etro Aberdeen RC. His team finished 5th and won the medals for most meritorious performance. Alan’s track career is less well remembered, but demonstrates speed and durability. He ran for North District (and won North championships) at every distance from 800m to 10,000m, including the steeplechase. The 5000m was won eight times and the 10,000m (PB 30.30) ten times. In addition he took part in the 4x400m relay. 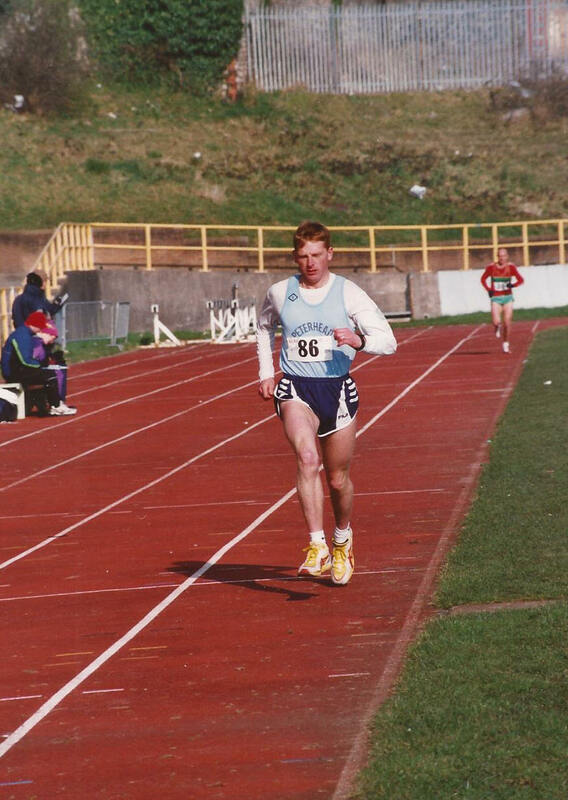 At the long-established Forres Highland Games in 1992, Alan won the 400m, 800m, 1500m and 3000m in one afternoon! (He twice won this 3k wearing a kilt,) In addition he won many local hill races. He says that he never concentrated on one event but simply wanted to do everything! Alan Reid won many road races, including three victories in the Inverness Half Marathon; the 1995 Aberdeen Half Marathon, and the Aberdeen 10k (1995 and 1996). His triumphs in the latter event must have been particularly sweet. 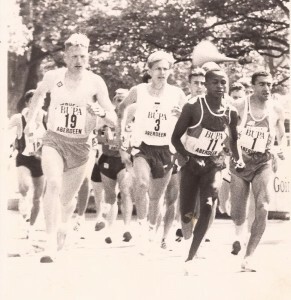 Alan had been second in 1992 and 1994 (when he also secured a silver medal in the concurrent Scottish 10k championship). 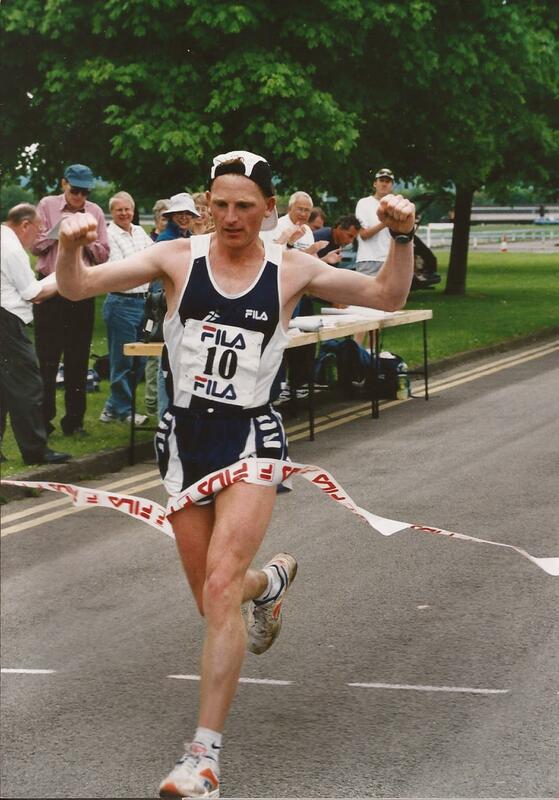 Then in 1995 (as third-placed Fraser Clyne wrote in the 2011 history of Aberdeen’s premier road race) he achieved “a runaway victory, showing no mercy as he blitzed through the streets and opened up a big lead which stretched to 73 seconds by the finish in beautiful Duthie Park”. A year later, Alan retained his title with another front-running performance, eighteen seconds clear of an elite group including Ross Arbuckle, Frankie Barton, Mike Carroll, Simon Pride and Fraser Clyne. Of course Alan frequently ‘cleaned up’ in local 10k races, such as Buckie, Elgin, Fraserburgh and Peterhead, plus the Lossiemouth Turkey Trot (and North of Scotland 10 mile championship). He won the Moray Marathon in 1995 and completed the arduous West Highland Way Race in 2008. Furthermore, wearing a heavy-duty Seaforth Highlanders outfit, he claimed the World Kilted Running Title at the Balmoral 10k! (Previously, at the Fettercairn 10k he had run 33.25 wearing the same kilt.) Alan reckons that he won this ‘true Scot’ World championship five times. In March 2001, Alan Reid travelled from Banff in cars belonging to Donald Ritchie and then Adrian Stott to the well-established Barry 40 miles track race in Wales and then back home again. (Don eventually reached Lossiemouth at 4.30 a.m. on the Monday, slept for less than four hours, then drove to his work!) Don says that he thoroughly enjoyed Alan’s company. The Barry 40 organiser Mick McGeoch relates that Alan won comparatively easily, leading as usual from gun to tape, having run the first of 160 laps in a swift 74 seconds, which unsurprisingly remains a record for the event! Alan’s times illustrate his tactics: 56.43 at 10 miles; 1.56.09 at 20 miles; 3 hours exactly at 30 miles. His winning time was 4.11.45, in front of experienced GB Internationals Ian Anderson (4.19.29) and Chris Finill. When Don Ritchie suggested that Alan might modify his racing strategy, the latter replied that he felt better running fast from the start. Alan remembers this as an especially satisfying win. 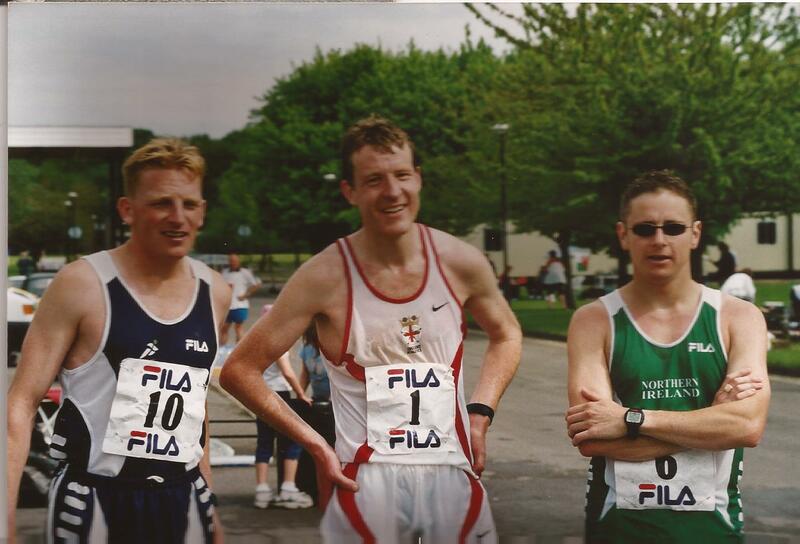 Alan Reid was chosen to represent Great Britain in three World 100k Championships (2000, 2001, 2002) in Holland, Brittany and Belgium. He finished two but unfortunately was pulled out of the third, despite that fact that he was still struggling on. Overall, Alan gained three GB vests and represented Scotland eight times. In championships he won 96 medals: 80 North District; 4 Inter-District; and 12 National, including 53 gold medals. Alan Reid’s career has been long, successful and unusual. He has many great racing performances to look back on with considerable satisfaction. Alan says that his ultra success was down to the fact that ‘I don’t give up very easily’. Too true! Unfortunately he began to suffer all sorts of chronic leg injuries and then a bad car crash in 2011 forced him out of the sport, we all hope temporarily. If anyone can come back fighting, Alan Reid will be that man!